Schizophrenia is a chronic and debilitating neuropsychiatric disorder affecting approximately 1% of the world’s population. This disease is associated with considerable morbidity placing a major financial burden on society. Antipsychotics have been the mainstay of the pharmacological treatment of schizophrenia for decades. The traditional typical and atypical antipsychotics demonstrate clinical efficacy in treating positive symptoms, such as hallucinations and delusions, while are largely ineffective and may worsen negative symptoms, such as blunted affect and social withdrawal, as well as cognitive function. The inability to treat these latter symptoms may contribute to social function impairment associated with schizophrenia. The dysfunction of multiple neurotransmitter systems in schizophrenia suggests that drugs selectively targeting one neurotransmission pathway are unlikely to meet all the therapeutic needs of this heterogeneous disorder. Often, however, the unintentional engagement of multiple pharmacological targets or even the excessive engagement of intended pharmacological targets can lead to undesired consequences and poor tolerability. In this article, we will review marketed typical and atypical antipsychotics and new therapeutic agents targeting dopamine receptors and other neurotransmitters for the treatment of schizophrenia. 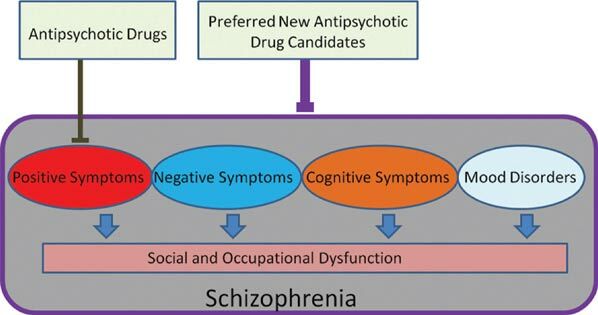 Representative typical and atypical antipsychotic drugs and new investigational drug candidates will be systematically reviewed and compared by reviewing structure-activity relationships, pharmacokinetic properties, drug metabolism and safety, pharmacological properties, preclinical data in animal models, clinical outcomes and associated side effects. Antipsychotic, Aripiprazole, Clozapine, Dopamine, Haloperidol, ITI-007, Risperidone, Schizophrenia. Intra-Cellular Therapies Inc, 430 East 29th Street, Suite 900, New York, NY 10016, United States.